Tonight I'm posting some updates to the IEWB-RS Volume 1 Version 5.0 section of OSPF, along with an interesting teaser on how OSPF path selection works towards external routes originated in an NSSA. In my pursuit of networking Nirvana, I have a motto; learn something new every day. This topic for sure will fall into that category for many engineers. As previously seen with OSPF Not-So-Stubby Areas, Type-7 NSSA External LSAs are translated to Type-5 External LSAs by the ABR connecting the NSSA to area 0. When multiple ABRs connect the NSSA to area 0, the ABR with the highest router-id is elected as the Type-7 to 5 translator, and is responsible for re-originating the Type-5 LSA into area 0. 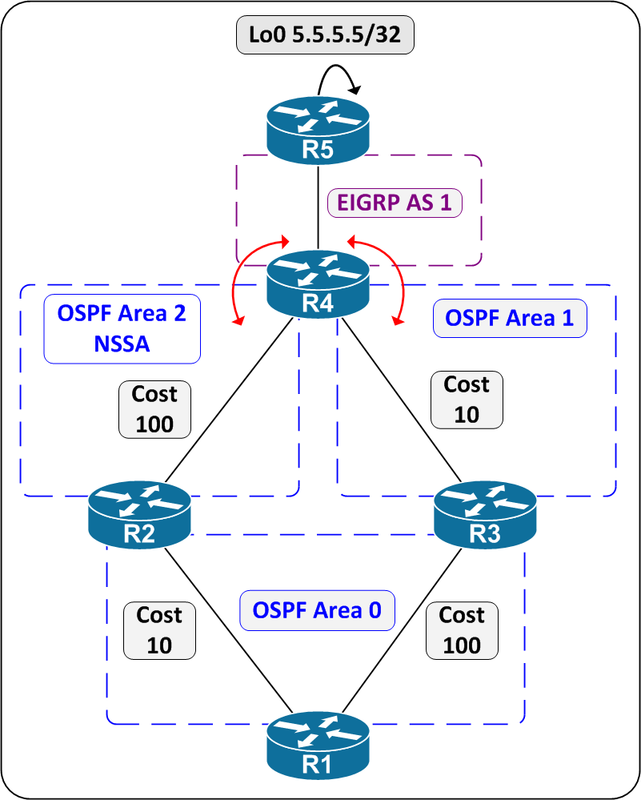 This election process is an optimization of the OSPF database, and relates to how the Type-7 NSSA External route uses the forward address field to ensure optimal routing. Recall that with normal external routes, only one Type-5 LSA is originated by the router performing the redistribution. When the route moves between areas, each ABR originates a Type-4 ASBR Summary LSA advertising their reachability to the ASBR. This means that for all Type-5 External LSA inter-area lookups OSPF would require Ext_Routes + Num_ABRs + Num_Routers LSAs, where Ext_Routes is the number of Type-5 LSAs, Num_ABRs is the number of ABRs generating Type-4 ASBR summaries, and Num_Routers is the number of Type-1 LSAs from the routers in the local area. Now with Type-7 LSAs the situation becomes more complicated, because this information needs to be re-originated at the ABR level as the route moves into area 0. Let’s suppose for the sake of argument that each ABR connecting the NSSA to area 0 did do a translation of Type-7 to 5. This would mean for all inter-area lookups on a Type-5 External LSAs that were translated from Type-7, there would be (NSSA_Routes * Num_ABRs) + Num_ABRs + Num_Routers LSAs, where NSSA_Routes is the number of Type-7 LSAs to start. This operation would be highly redundant and inefficient, because each ABR would re-originate the same Type-5 LSA, each with the same forwarding address. To avoid this only one ABR performs the Type-7 to 5 translation, but maintains the forward address field, essentially separating the relationship between the routing advertisement and the traffic flow. This principle can be illustrated as follows. Before any modification in the OSPF domain, R5 performs a lookup on the Type-5 LSA for 9.9.9.9 that was translated from a Type-7 LSA. At this point R3 has an OSPF Router-ID of 150.1.3.3, and R6 has 150.1.6.6. The advertising router R5 sees is 150.1.6.6 (R6), since R6 won the translator election due to the higher RID. Note however, the forward address is set to 150.1.9.9 (SW3). This means that R5 next needs to figure out how to route towards 150.1.9.9. Since 150.1.9.9 does not belong to a device in the same area as R5, an inter-area lookup is performed on the Type-3 LSA. R5 finds that two ABRs are advertising the route to 150.1.9.9, 150.1.3.3 (R3) and 150.1.6.6 (R6), both with a metric of 3. R5 now needs to find what the metric is to reach these ABRs. R5 checks its locally originated Type-1 Router LSA and finds that 150.1.1.1 (R1) and 150.1.3.3 (R3) are directly attached, both with a metric of 64. R5 asks R1 who it is adjacent with, and finds 150.1.6.6 (R6) is connected over the a Virtual-Link with a metric of 1. This means that R5’s intra-area cost to R3 is 64, and to R6 is 65. Since both R3 and R6 reported a cost of 3 to the forward address 150.1.9.9, the total forward metric through R6 is 65+3 = 68, but is only 64+3 = 67 through R3. Therefore although the route is originated into area 0 by R6, the Type-7 to 5 translator, the traffic does not actually flow through R6. Instead the path through R3 installed with the default redistribution metric of 20 for the E2 route, and a forward metric of 67 through R3. The Type-7 to 5 translator election can be modified by increasing R3’s router-id to be higher than R6’s. R5 now sees the advertising router as 150.1.30.30 (R3), because this is the highest router-id of the ABRs connecting the NSSA to area 0. Although the advertising router has changed, the forward address is still 150.1.9.9, which means the traffic flow has not changed. Only once the forward metric via R3 is higher than the forward metric via R6 will the path selection change. This can be accomplished by changing the OSPF cost on R3’s link to SW1. Now when R5 computes the forward metric through R3 it sees the same intra-area cost of 64 to R3, but R3 increased the advertised metric to 150.1.9.9 to 1002. The final result is that the route is installed via R6 with a metric of 20 reported by the ASBR, plus the forward metric of 68 through R6. If R6 loses connectivity to area 0 its route to the forward address is lost, and traffic is rerouted to R3. At the age of 20, Brian McGahan earned his first CCIE in Routing & Switching, and became known as the “youngest engineer in the world.” He continued on to earn CCIE certifications in Security, Service Provider, and Data Center. Brian has developed and taught for INE since 2002, setting the bar for CCIE training and helping thousands of engineers obtain their own certifications--we’re proud to have such an accomplished and driven instructor on the INE team. When he is not developing new products for INE, he consults with large ISPs and enterprise customers. You may contact Brian McGahan at bmcgahan@ine.com, follow him on Twitter, or find him helping others in INE’s IEOC Community Forum.